You’re out with Mum & Dad. THIS IS EXCITING. It’s therefore important to let everyone know just how excited you are! Multiple high-pitched squeals in close sequence for around 5-10 minutes will usually suffice. If however you’re feeling a bit tired or cranky, it is even more important to let everyone know just how immensely PISSED OFF you are. The key thing to remember is that Mums & Dads hate attention from other adults. Drawing as much attention is therefore our key objective here. A first tactic is to hold your breath and go as red as you can while fighting yourself free from Mum. This is pretty effective since Mum will usually draw the attention all by herself as she tries to keep hold of you. Sometimes this is not enough though, and a bit of screaming and kicking will be necessary. If all goes well you’ll be put down to toddle on the floor. At this point you’re onto a winner! Whether you’re feeling happy or not, being out for dinner with Mum & Dad is always a great opportunity to stretch your legs. This again is another great way to attract attention to Mum & Dad who bizarrely think they’re out for a sit down. If you’ve successfully followed Tip #1 then you’ve likely made enough noise to not have to endure the monotony of the high chair yet. Now is therefore the best time to explore your surroundings. The best target is the exit, but if there are too many obstacles, then the kitchen comes a close second. Don’t be deterred if Mum or Dad keep picking you up to cuddle you on their knee – a simple squawk will ensure your release. If upon the seventh try the kitchen or exit is not an option, then aim for a neighbouring table. There are usually bags in close range that can be touched or even emptied, along with table napkins, knives and forks which can be pulled down. If you’re lucky you might be in a place with some nice items that Mums & Dads can buy to take home. These are often books and shiny packages, boxes and jars. These are great fun and are also fantastic to help attract attention! Make full use of the opportunity to grab and examine everything you possibly can. Sometimes these items are out of reach. In this circumstance a good tactic is to feign wanting a cuddle from Dad. While he is distracted with your sudden affection and lifts you for a snuggle, reach out and grab whatever you can! The brighter the better. Jars are the goal here. If Dad catches on and puts you down then there are often some great things to grab within heights reach. These are commonly boxes, which as you know are FANTASTIC! These boxes usually contain completely useless contents, but this can be easily rectified by simply throwing the box on the floor so the contents spill out. This is a two-pronged approach whereby a lot of noise can be made, while also freeing up the box for closer inspection. Mum will sometimes buy the box so you can keep it. At this point it of course becomes completely worthless and you should discard it at the soonest. At some point during your trip out with Mum & Dad, it is quite possible that you will be presented with food. At this point you will most likely be faced with the ghastly high-chair. You must resist the high-chair with every inch of your being – I absolutely cannot stress this enough. Struggle, push, flail, these are all very important maneuvers, but the most important element is the noise. You can achieve maximum noise in three easy steps: 1) Inhale as much air as your body can hold 2) Exhale in one long sustained shout that varies in depth and pitch 3) Repeat three times while maintaining flailing maneuvers. **A side note. While you can usually resist Mum alone, Dad proves a powerful ally. 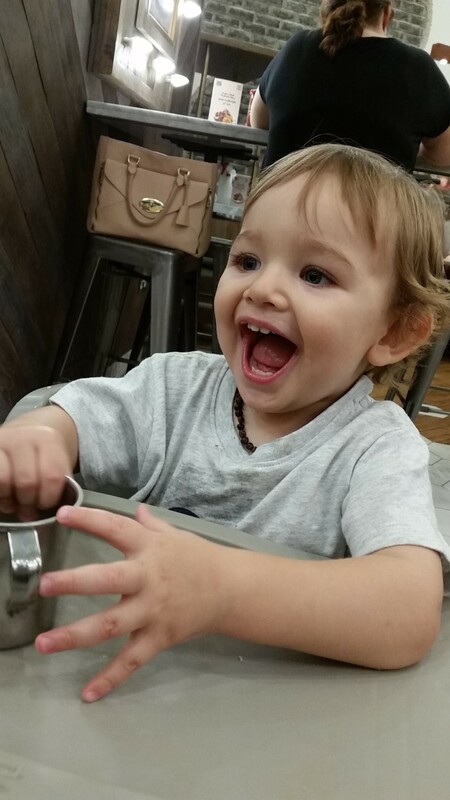 It is the likely scenario that you will be overpowered into the high-chair then securely buckled. Do not struggle at this point, it is of no use. Instead carry on making noise to ensure maximum attention is on Mum & Dad as they sit down to eat. Don’t panic when presented with food. It can be used greatly to your advantage. Think big with this one. We’re going for ultimate mess and attention here; much bigger than your average stay-at-home dinner mess. To achieve this, there is a simple rule of thumb to follow: If it tastes horrible, throw it. If it tastes nice, chew for a bit and then throw it. The mushier the better. A banana is good, as is mashed potato. Small, brightly coloured pieces of fruit are the most advantageous. The potential damage that can be caused by a solitary raspberry should never be underestimated! Should your food be running low, point at Mum & Dad’s food until they give you some. Throw it immediately and then repeat. They’ll give you at least three chances so make them count. Sometimes Mum will bend down to attempt to clear some of the mess. This is always an opportune moment to grab her hair. But be sure to give her your biggest cutest smile when she looks up. Works a charm! Speaking of charm, if you’re sure a suitable amount of mess has been created, then you’re about ready to go. Give your audience the biggest smile while Mum dances around with wet wipes. Once home, sweetly fall to sleep snuggled on Mum. She will almost instantly forget the trauma of eating out with a baby-tot. You’ll be out for coffee the very next day, guaranteed!